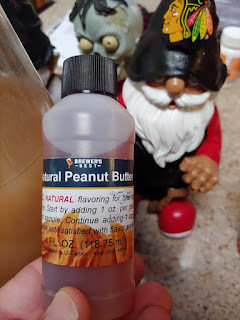 It is one of those things that I won't seek out everyday, but is a pleasant dessert beer flavor ... especially in dark chocolate or caramel beer styles. I mention every year how my wife looks for these types of beers. Not sure this is the first year people have been so shocked by peanut butter in particular. Oh well ... I'm not brewing for those people. For what it is worth, I am not planning on adding a whole lot of peanut butter flavor in this beer. 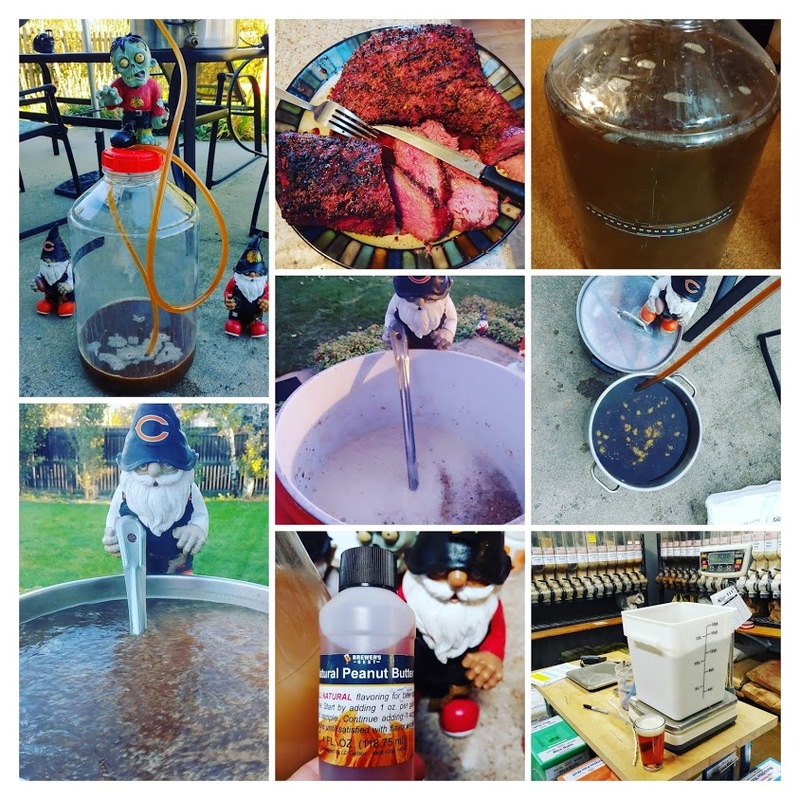 I just want help highlight the nutty flavor that I get from the Wyeast 1272 American Ale II yeast. I don't really expect people will necessarily recognize it as peanut butter. Maybe more of a Nut Brown Ale flavor. I bought my ingredients Friday. I made a yeast starter on Saturday. 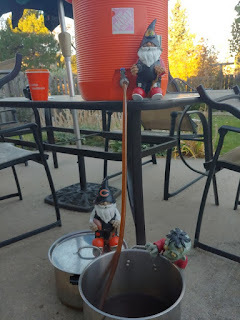 I got the brew day started fairly late on Sunday morning. 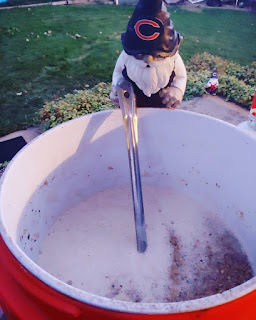 I didn't start heating the strike water for the mash until 6:30AM. I got the mash itself going just before 7. I'm not used to having sun light for my mashing picture. The mash itself went pretty well. The temperature was a bit higher than the recipe called for, but not enough to worry about it. A little extra body in a winter warmer is fine. It was 8:30 or so before I had my brew kettle filled and heating on the burner. 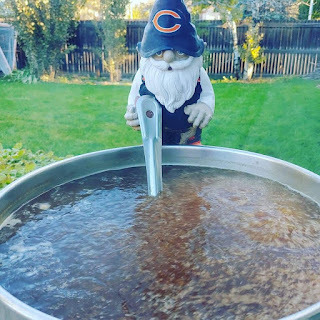 The boil started shortly after that. The pre-boil gravity was about perfect. 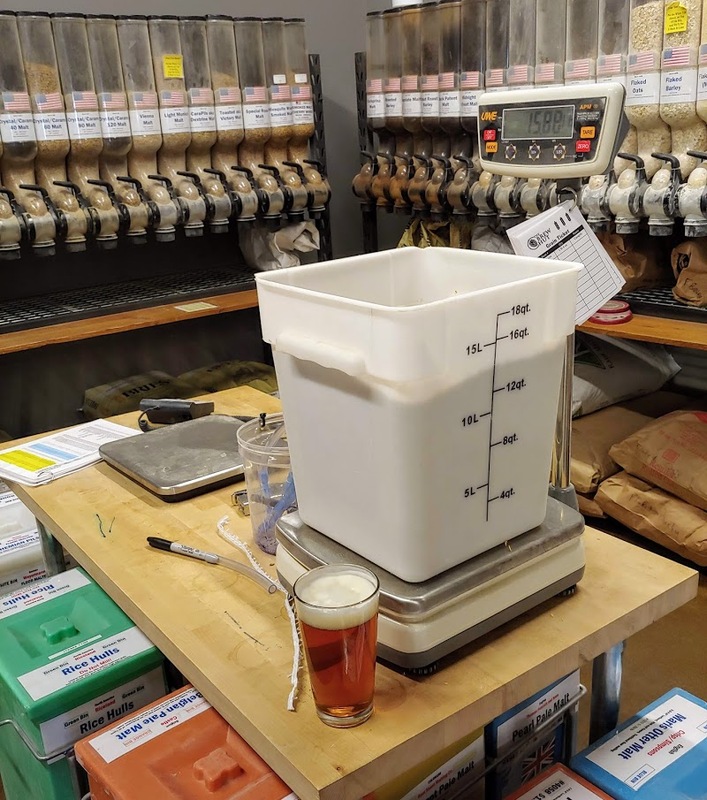 I had not added my water salts in the mash or sparge water, so I put it in the boil. I'm not sure this is a difference that I would be able to taste side-by-side. It certainly isn't anything I'll be able to point out without having a side-by-side comparison. I don't remember anything remarkable about the boil. It went as planned. I turned off the burner a little after 9:30. 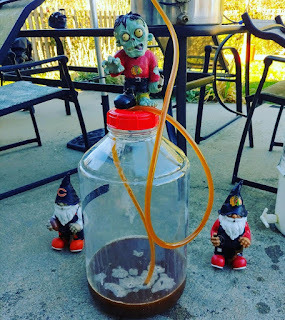 I chilled to below 70 degrees and racked the wort into the fermentor. At 11:20, I watched the Bears. After brew day and football, I smoked 2 1.75 pound tri-tips. They had been on sale at our local King Sooper grocery, I had grabbed a couple. 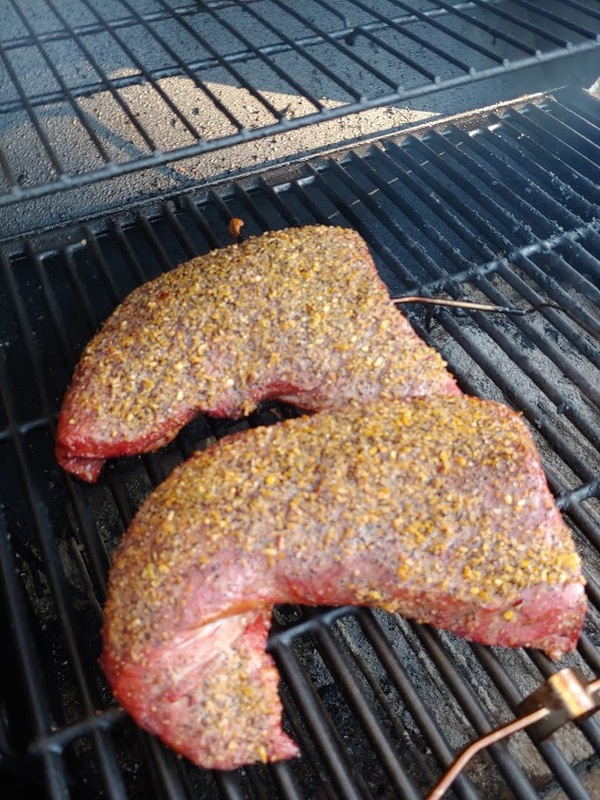 I am pretty sure these are smaller than most of the youtube videos I've seen about making tri-tips. That is why I got two. 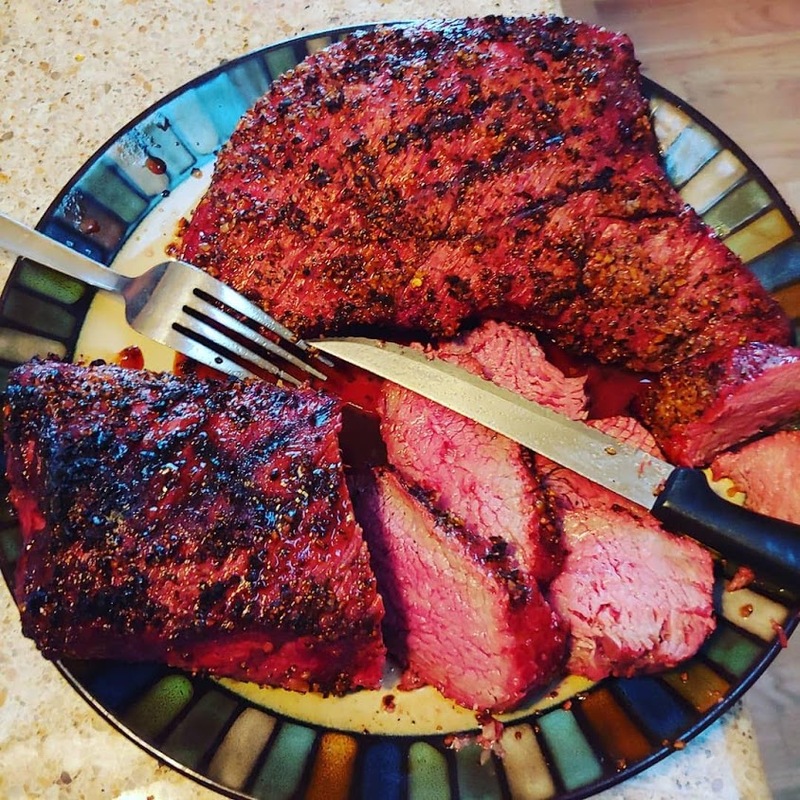 This was my first time making tri-tips. I think it might have been my first time eating them as well. To make them, I smoked with apple-wood smoke at 250 to 270 to an internal meat temperature of about 124 degrees. After that, I added charcoal to the grill and seared the tri-tips for a few minutes on each side. I let them rest a few minutes before cutting them up. Most of us had beef sandwiches. One of my kids just had the slices. These turned out awesome. They were somewhere between medium rare and medium. Very tender. Wonderful beef flavor. The seasoning I used was delicious. I really enjoyed the sandwiches I had. We had enough for left-overs. Both my wife and I loved the slices for lunch a couple times during the follow week. 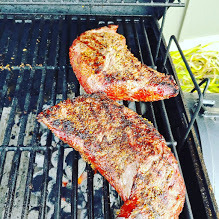 I am absolutely going to have to keep an eye on tri-tip sales and make them again. And ... do me a favor and subscribe to my SheppyBrew Smokehouse and Brewery youtube channel.